There are many opportunities for careers in language translation and interpretation. The languages you speak and where you live can lead you to a wide variety of translation positions. 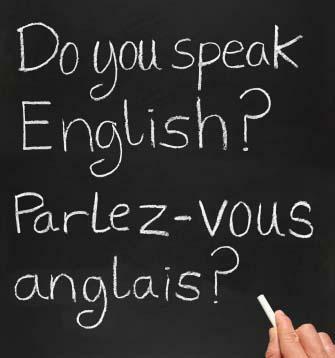 Language translators are needed in many types of job settings. Some translators work in the government environment providing translation for residents who are having trouble interacting in English. Other translators work in corporate environments, providing translation of business information and publications. Translators specialize in the language they translate. Common specialties are Spanish, Mandarin, Cantonese, Vietnamese, Tagalog, Korean and American Sign Language. Federal courts in bilingual areas often employ professional interpreters on a day or half-day basis to provide in-court translation. Most interpreters have completed interpretation education at a college or university and many have completed the written and oral Federal certification exam offered every other year. According to the Bureau of Labor Statistics, the median salary for a court interpreter was $43,300 in 2010. State and local courts also employ professional interpreters for in-court translation. These translators may also be asked to provide translation services to the District Attorney's office and to the police department. The educational and certification requirements vary by state as do the salaries an interpreter can expect to earn. Generally, states with large populations of non-English speaking citizens usually have large numbers of interpreters available. These interpreters usually earn less than they would in a state where it is more difficult to find an interpreter. Search on the Internet for the specific court in the area that you are interested in. For positions at a United States Court location, search the US Courts Job Vacancy website. Another option is to use the advanced search function to find a local court that might be hiring. Some police stations may hire interpreters specifically for their departments. Contact the department you are interested in to see if they are hiring. Book publishers often employ translators to rewrite books, manuals and instructions that will be used overseas. Certification or education in translation is a plus, but is typically not required. The publisher is usually looking for someone who is fluent in the required language, has an understanding of the information that is being translated, and knows the specific vocabulary used by the employer. The employer might require a degree in the specialty being discussed in the publication and several years of experience in the field. These translators might be working on a full-time basis or could be hired on a project basis. A typical annual salary for a translator is approximately $41,990 per year, according to Salary.com. A freelance translator could earn anywhere from $20 to $150 an hour depending on the language used and the material being translated. It is more difficult to find a full-time book translator position; it is more common to have multiple clients and work on a freelance or contract basis. You can look for freelance positions with different companies like Translation Company and ComTranslations or others that you may find on the web. You can bid on contracts or apply for specific translating projects at freelance websites like Upwork.com, ProZ.com or Guru.com. Hospitals, health organizations and large medical facilities often employ bilingual individuals who provide a communication link between English-speaking staff and non-English speaking patients or family members. The interpreter often has a medical certification, such as nursing, which enables the interpreter to fully understand the information they are being asked to interpret. The annual salary is approximately $45,960, according to the Bureau of Labor Statistics. Contact the hospitals in your area to find out if there are in-house interpreter positions. There are companies that offer interpretation services to hospitals across the country like MEJ Personal Business Services, Inc., or CTS Language Link. Join the International Medical Interpreters Association or the medical division of the American Translators Association, or the National Council on Interpreting in Health Care so you can utilize these resources for your job search or further training. Simultaneous interpreters conduct their duties at the same time as another person is speaking. Not only does the interpreter need to have an excellent knowledge of at least two languages to do this type of work, but he or she must also be able to keep track of what the speaker is saying while repeating it in another language. Consecutive interpreters listen to a speaker and then repeat what was said afterward. This method is sometimes referred to as "elbow" interpretation, since the interpreter often sits or stands beside the person who requires an interpreter. The interpreter then listens to his or her client's response and conveys it to the other person involved in the conversation. A person interested in this type of work can find employment with the government, broadcasting corporations or with international agencies, such as the United Nations. The salary range for this position can be as high as $345-$575 per day. Some people working in the field prefer to offer their services on a freelance basis, as opposed to working for an employer. A person working in this capacity for a local government can expect to earn about $45,500 per annum according to the U.S. Bureau of Labor Statistics. Visit the UN Career Portal or NATO. Look for opportunities with companies like Japan Communications Consultants. Many professional interpreters have degrees in the field in which they have chosen to work (such as nursing or law) with specialty courses or certification in translation. Interpreters who are involved in the top levels of international business, entertainment, health and diplomacy often attend the Graduate School of Translation & Interpretation at the Monterey Institute of International Studies in Monterey, California. ProZi offers opportunities for translators and interpreter to network, meet potential clients, and look for opportunities. They can also meet with other translators and learn about the craft. This site offers online and offline conferences and educational opportunities. TranslatorsCafe allows you to look for positions, offer your services to translation agencies, and ask questions about terminology to get help with a project. There are discussion forums to gather information from other professionals. TranslatorPub also provides jobs worldwide and offers opportunities from introductions for agencies as well. Basic membership is free but some features are only available once you join the website for a fee. General job boards may also have listings for this career choice. For example, Indeed.com and Monster.com list translation and interpretation positions from around the country and you can narrow down your search by location and salary. Becoming a translator can be a terrific career for someone who is proficient in languages other than English. It can be rewarding to be able to help non-English speaking people understand the information being presented to them. It can also be an excellent way to get involved in areas such as medicine, law, politics, publishing and entertainment. Translating is a career that offers flexibility in the types of assignments you undertake as well as the geographical area in which you choose to live.